Where is it? : This reserve is in the Adelaide Hills Face Zone between CSIRO, Urrbrae and almost to the South-Eastern Freeway at Eagle-on-the-Hill. Public transport is available on Bus Route 170 (Monday to Friday only) to Mitcham Square (Stop 23 on Waite Road) and then walk up Hartley Grove to the reserve. Car parking is also available in the loop at the end of Hartley Grove. Owner: The University of Adelaide. History: In October 1913 Peter Waite wrote to the Premier of South Australia, Hon. A. H. Peake, and the Chancellor of the University of Adelaide, the Rt. Hon. Sir Samuel Way, informing them that he intended presenting the Urrbrae property of 54 hectares to the University of Adelaide. The eastern half was to be used for scientific studies related to agriculture and the western half as a public park. In 1915 Peter Waite bought the Claremont Estate of 21 hectares and 45 hectares of the foothill part of the Netherby Estate, both of which adjoined Urrbrae, transferring their ownership to the University of Adelaide. 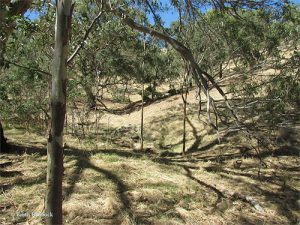 Habitat: It preserves grey box (Eucalyptus microcarpa) grassy woodland. River red gums (E. camaldulensis) grow in gullies and on the shady wetter south-facing slopes. On the higher slopes at the eastern end of the reserve drooping sheaoak (Allocasuarina verticillata) occurs. Other trees in the reserve are South Australian blue gum (E. leucoxylon) and native cherry (Exoxcarpos cupressiformis). If you need help with identification submit photo's of birds to us. Please include location details. Birds SA is a not-for-profit organisation for birds and birdwatchers in SA. Join us to support our endeavours, and to get into birdwatching!